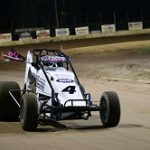 It was a case of youth and experience taking the spoils as both teenager Carly Walsh and veteran Peter Logue claimed victories at Horsham’s Blue Ribbon Raceway as the curtain came down on the 2017-18 Victorian Wingless Sprint season. Following on from her recent resounding Salt Electrical Ladies of the Dirt Series win, Walsh proved once again she is a force to be reckoned with, taking a solid win on night one while on night two, Logue used his years of experience to lead home a quality field in the season ending feature race. After a pair of heat-race wins on the opening night – one from the back of the field – Walsh earned the right to start the 25-lap feature race from pole and used that to her full advantage, taking the lead from the outset and dominating the race from flag to flag. 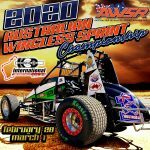 Following Walsh across the line in second place was Marcus Green, backing up his impressive form of late after a second-place finish at Rushworth Speedway. Repeating his recent success, Green, who earlier in the race set a new one-lap record, shadowed Walsh for the entire distance, just coming up short by 0.8 of a second at the fall of the chequered flag. 410 Sprintcar regular Brayden Parr completed the podium finishers in a hard-charging third. Aboard the VX # 69 John Rotheram-owned car in a cameo appearance, the teenager started from position eight in the field. Crossing the line in fourth was Shaun Lyness, capping what has been a strong finish to the season. Lyness was particularly impressive, coming from the sixth row in the field and made major gains early in the race. Rounding out the top-five finishers was Glenn Watts who was contesting the final two meetings of his career. The former Victorian Champion fell back to 13th on the opening lap before working his way back to fifth in the closing 10 laps of the race and hanging on for a good finish. Mick Rigby, B-main winner Jeremy Beddison, Geoff Cook, Steven Loader and Mikayla Hein completed the top-10 finishers. 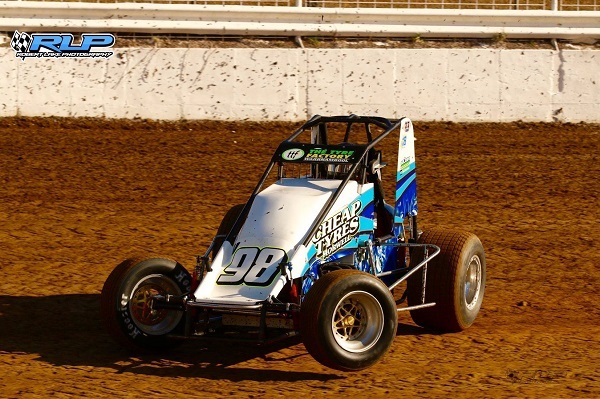 It was a competitive return to Wingless Sprints for Hein, who is a former Australia # 4. Completing the finishers was Travis Beasley, Ben Grey, Brittany Kuypers and Steven Hateley. Non-finishers were Logue, Clint McLaren, Luke Schneider, Jake Warren, Raymond Klemm and Ross Jarred. Heat-race wins went to Walsh (x 2), Watts, Beasley, Green and Cook, while the B main went to Beddison from Hein and Grey. Teams returned for night two of action the following night and included the inclusion of two drivers into the field in Daniel Storer and Matthew Symons. Both drivers made trek of over 1000kms home after the unfortunate washout at Sydney’s Valvoline Raceway in NSW the previous night. Being a late inclusion meant a rear of field start in their respective heat races. With well over three decades of speedway experience behind him, Logue bounced back from a DNF the previous night to mirror Walsh’s performance from the opening night by leading all 25 laps to claim the season final feature race. Such was Logue’s pace, he finished over a second ahead of his nearest rival. As mentioned, winding up his racing career, Watts celebrated his final ever race with a well-deserved second place. Improving on his fifth-place finish the previous night, Watts stayed glued to the tail of Logue for most of the race before having to settle for second. Walsh was impressive again, recording a third-place finish. Walsh was in contention and remained within striking distance of Watts until the final half of the race when she began to fade but still did enough to hold on and snare the final place on the podium. Rounding out the top-five finishers was Parr who looked impressive all night and put in a solid performance over the two nights and Symons who started the feature race from position 16. Symons spent the entire race distance charging his way through the pack. Rounding out the top-10 finishers was Lyness, Nic Green, Robert Whiteside, Schneider and Rigby. Warren, McLaren, Beddison, Storer, Marcus Green, Cook, Jarred, Klemm and Loader rounded out the remaining finishers. The only non-finisher of the event was Hein after she retired from the race after just eight laps. Earlier in the night, the heat-race wins went the way of Nic Green, Parr, Whiteside, Watts, Lyness and Beddison. The B main win was recorded by Storer ahead of Symons and Marcus Green in second and third place respectively.